Four and a half years ago, I set out to blog to cast the net of healing far and wide. Writing would serve as a medium to connect with folks unable to schedule a healing session with me. I intended to spotlight some of my best photographs emblazoned with inspirational quotes. An opportunity to share insights on mindful living and the healing modalities in which I’d been trained, I approached my blog with the firm boundaries I’d cultivated as a Social Worker. I thought I’d shy away from the personal. I was wrong. To prepare for the milestone 50th entry that your eyes are now feasting on, I reread through the last 49 pieces. I was struck by my courage. It felt like reading the writing of a stranger. My process surprised me. Brené Brown encourages that “owning our story and loving ourselves through the process is the bravest thing we will ever do”. A cathartic release, these last 49 entries detail my unraveling, the process of owning my story and learning, bit by bit, to love myself more. This bold set of writing cast light upon many shadows. I wrote through transitions galore from a major surgery to the deterioration of my longest partnership to the loss of my mom from resolutions and retreats to travel through 11 countries. Aspects of my self and my life hidden away for so long were unveiled. reread it. The tenderness and ownership here cut to the core. realization of our unbound nature. ♥ Soul Cry that stands out as my favorite poem. ♥ I ♥ CAMBODIA which contains my most beloved pictures. ♥ Three Years Ago Today that I relish as one of the rawest of the many pieces about my mom. encourages self reflection and mirror work. ♥ My only recorded meditation to date, a lovingkindness practice, shared in Kindness is a Bridge. ♥ My first blog, How you Start Matters, which outlines practical intentionality for our every day lives. ♥ The power of Krav Maga and tapping into your own Fighting Spirit. ♥ The recognition of growth in Holding Patterns which resonated with many people. vulnerability of telling my story. ♥ Winding my way through New Years’ practices in Illuminate 2016! ♥ Untangling fear and a prayer for ancestral forgiveness in I Saw the Light. ♥ Dissolution in the Desert which offers an awesome reflection on Vipassana retreats. replayed throughout my Peace Corps service. ♥ Lessons in Receiving one of my most love-filled posts from South Africa. being worked, much like this blogging process and my entire Peace Corps service. 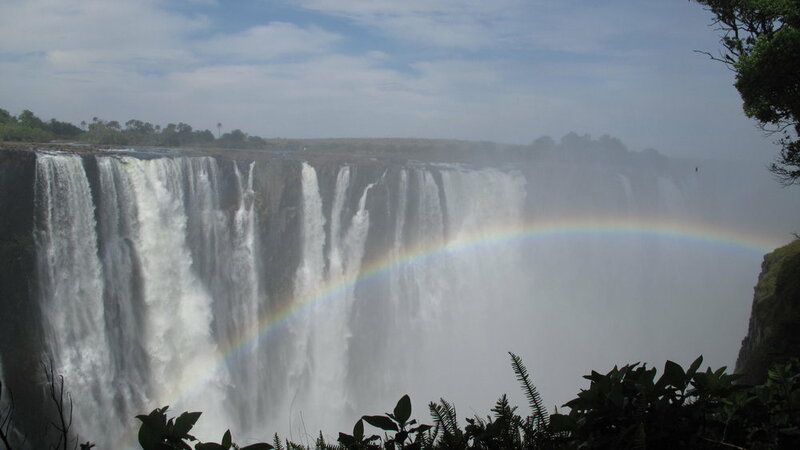 The Other Side: Connect with the Photo: Taken right at the end of a visit to Victoria Falls. Shot from the Zambia side looking towards Zimbabwe. I’m heartened to recognize the healing that needed to happen in order to tell and share my story. I’m incredibly proud of this body of work. I’m heartened by the healing that has happened which invites me to release the story. I’m now ready for the next chapter. I’m open to crafting a new story. I’m honored to turn the page. “Draw a large circle on the piece of paper in front of you. Draw a smaller circle beside it. Label the smaller circle, ‘me.’ Label the larger circle ‘comfort’.” In March, 2017, a facilitator provided this exercise in an effort to depict the reality of Peace Corps and issued us a challenge to relinquish control in order to have a successful service in South Africa. Having now been in country for 20 months, the diagram of me existing outside my comfort zone accurately describes my life with control and autonomy sacrificed long ago. Today, I celebrate 100 days on my TB meds. As I glanced at my medication app earlier this week, I decided to honor today and my 100% compliance to my health regimen through reflection and writing. After my TB diagnosis several months ago, I discussed treatment options with the doctors. If I chose to forgo Peace Corps medical recommendations, including TB meds, I forfeited the right for medical coverage for TB-related issues that may arise post service, as well as potentially jeopardizing my ability to stay in country. Days before I started the medication, I made the conscious choice to balance the Western medicine approach with three new daily practices. I supplemented my morning routine with ACCESS, a BodyTalk technique that balances my brain and body, bolsters hydration and body chemistry and helps manage stress. In the evening, I stretch my toes and ankles in a technique I learned in Bali and fall asleep to an amazing guided meditation that is similar to what I imagine an Ambien to be like. I’m incredibly grateful for my medication app. Its prompts have supported my medication adherence, increased my water consumption and highlighted serious side effects of my medication. I linked my mood tracker to a gratitude practice in which I paused three times a day to notice what I was thankful for. Last month, I noticed that my mood changed and realized I was marking “so-so” each of the three times per day. My affect had dulled and I was literally unable to feel joy. The colors of my life were muted. I cannot fully describe it, but it was a marked difference from my norm. I started to mindfully monitor this disconcerting occurrence. On vacation, amazing moments felt fragmented. Even when I was around children, I didn’t feel the joyful moments fully. It felt like there was an energetic block between me and happiness that I’d never felt before. I noted this and other symptoms in last month’s follow up appointments with the doctors. Upon receipt of my blood test results from these visits, I was left with more questions than answers. Psychiatric side effects from my TB meds were discussed as common and the meds were reduced by half. 11 daily pills that include additional B and D vitamins, selenium and zinc, were added to my routine to protect my body from some of the effects the TB meds may be having. My blood tests came back negative for TB, positive for schistosomiasis, and my hormone levels were low. I’ve been told the negative TB result shows the medication is working (and my self care practices have surely assisted) and I have to continue on the medication. As I was just treated for schisto prior to starting my TB meds, the doctors decided I will await treatment at my Close of Service. It’s certainly challenging to wait six months for a treatment of a known parasite. I’m thankful to report that I have witnessed an elevation of my mood since the reduction of my TB medications and additional vitamins. Though I’m not quite back to my normal worldview, things are not quite as dulled as they were several weeks ago. Through all of this, I’ve had the busiest period of my Peace Corps service to date. I hosted a graduation for my four Roots Tribe Yoga classes, distributed over 200 Mother Bears at 6 events, inspired a poultry project and gardening project to promote healthy living and economic empowerment to two groups of women in my village, facilitated workshops on safe sexual practices and pregnancy and HIV prevention and set boundaries on numerous occasions, including recently walking away from a particularly challenging meeting and saying “no” to a project. One of my goals for Peace Corps service was to acknowledge my ability to stand confidently on my own two feet in this world and recognize my own gifts. I now believe that I can not only confidently stand on these two feet of mine, but that I can venture forth through these last six months of service and into the next chapter of my life. This Peace Corps service has been one of the most challenging experiences of my life. Each time I barely got my head above water, another wave crashed upon me in the form of site changes, illness and trauma. You name it. I’ve faced it. I like to think that I’ve faced each situation with grace. It is a huge relief that I have actually gleaned lessons from all of these trials. Thank you for joining this chapter of my story. I aim to chronicle the journey of a Peace Corps Volunteer in South Africa and appreciate your support. “Your Mom will come in with a necklace of chicken heads with the chickens’ blood dripping down her body.” “Don’t be scared, though you will be.” “People will drum and dance all night. You will not sleep.” This was the helpful advice intended to prepare me for what took place at my house last weekend. In South Africa, great homage is paid to one’s ancestors and one’s whole life may be spent trying to placate them. When bad things happen, including illness, South Africans commonly point to the upset of the ancestors as to the origin of the bad luck. Through dreams or the intercession of a sangoma, a traditional healer, the ancestors may ask for a ritual ceremony. People gather for a lengthy rite and animals are, indeed, sacrificed in an attempt to settle the spirits and invite healing. Such was the case at my house last week. The only regular traffic in my village consists of men driving donkey carts full of various hauls. 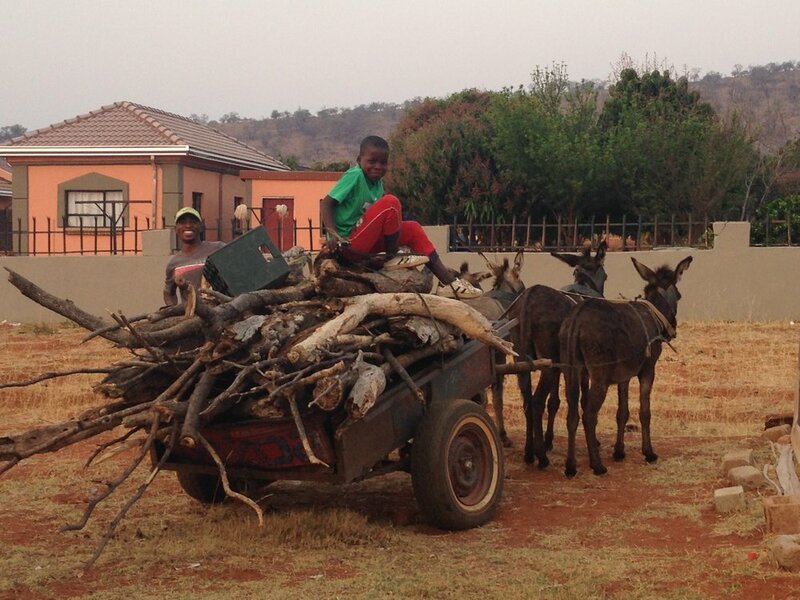 One afternoon, I arrived home from work as a donkey cart full of wood was being unloaded in our side yard. Preparations for last Saturday’s ceremony had officially begun. The next day, two Gogos came to brew traditional beer. The following morning, my Host Mama smeared cow dung over all the concrete surfaces of our courtyard in preparation for the next day’s event. I had questions about every one of these actions and the only answer I received was, “this is our culture.” Left without answers and taking into account my sensitive and empathetic nature, I realized I had to ground myself. I consulted a trusted confidant in the States to ensure I was properly shielded from the influx of energies sure to ensue. The day of the ritual was a semi-flurry of activity with plenty of last minute arrangements, as is characteristic of South Africa planning. Around 7pm, Gogos and village elders started to arrive. Thankfully, the tent had been erected, but the lighting of the tent had still not been sorted. As Gogos do, they sat on the ground instead of the provided chairs. My Host Sister and I acted as hostesses, as our Host Mama had not yet returned from the neighboring village. My Host Sister, having never attended such a ceremony was as lost as I was. We prepared tea and served scones to the guests. At one point, I was asked to wait on the room of sangomas. As I entered the room, a rush of energy almost overtook me. It wasn’t a collective energy, but coming from an undetermined source. I took a deep breath, got scolded for improper greeting, set down the tea and scones and left the room. Finally, my teenage language tutor and her friend arrived and provided some guidance. They told us the ceremony was to start at 10pm. As more people gathered, they brought blankets with them and amazingly slept amongst the noise as all of us awaited the event’s start. Around 10pm, the drumming began and we gathered in the tent. For the next four hours, I witnessed, singing, drumming and dancing as the Gogos, most of whom I believe were sangomas, became possessed by their ancestors. The first, I thought, was having a seizure. Then I realized, similar to kriyas in the yogic tradition, convulsions ensued indicating the presence of the energy, in this case the ancestor within each respective woman. It was astounding to witness elderly women who were unsteady on their feet while walking transform into agile beings while dancing in their traditional outfits. I have no idea what took place during these couple of hours, but it was captivating. Around 2am, I chose to retreat to my room after the eldest of the Gogos danced. In the sanctuary of my room, I burned sage, did some energy healing and slept for about 3 hours while the drumming, dancing, singing and the slaughtering of a goat continued on my doorstep. I awoke the next morning, performed my own morning rituals and readied for what became a whole day of interesting sights and sounds. On Sunday, the only male of the group performed throughout the day. At one point, a young boy with Downs Syndrome rose from the crowd and was dancing with the sangoma. Their interactions were mesmerizing. Later in the afternoon, the sangoma led my Host Mama back to the tent where she collapsed shortly thereafter. She writhed on the ground while being tended to by several sangomas. As I sat with the young children of my household, the trauma-informed professional inside me was screaming to protect them from their mother’s convulsions. As I don’t speak enough Sepedi to have devised any explanation, the best I could do was rub their backs and concentrate on their heart chakras. As they took my Host Mama out of the tent, the enormity of what they saw hit them. I couldn’t do a thing. My elder Host Sister later told them that our Mama was just playing with her friends, which seemed to calm them. The ceremony concluded as all South African gatherings do, with the consumption of copious amounts of alcohol. This is consistently my cue to exit. I withdrew to my room, burned some sage, turned on my Himalayan salt lamp and did some energetic clearing. Interestingly, my Host Mother lost her voice for the rest of that day. My host Sister lost hers the next day. I spent most of this week the sickest I’ve been in a long time, was unable to sleep nightly and lost my voice midweek. I’ve done daily clearing and kept up with my own practices. I took this weekend as an intentional unplug and recharge, clearing my schedule and resting to hopefully return to a more balanced state. Should you wish to learn more about traditional healing, I recently read Susan Schuster Campbell’s Called to Heal: Traditional Healing meets Modern Medicine in Southern Africa Today and found it a fascinating read. Tears stream down my face as my mind races and I enter go-mode. In the midst of crisis, my nurtured former Social Worker Self joins forces with my natured Planning Self, blazing a million steps ahead. Add to the mix my lack of knowledge about tuberculosis and I am adrift, out of my body, out of the moment. I think of long-term consequences, being labeled with a pre-existing condition. Questions abound, “Is this fatal? Will I live with this for the rest of my life? Am I infecting others? Where did I get this? Does this mean I’ll return to the States?” In the last several weeks, I’ve found answers to these questions. I’ve discovered resources. I’ve regained my grounding in many surprising ways. I set out for my Mid-Service Training (MST) with what I thought was anxiety about seeing my cohort, the group of people with whom I arrived here in South Africa 16 months ago. The purpose of MST is to fuel Peace Corps Volunteers during a notoriously emotional slump, provide a midpoint medical check up and propel us to succeed in the second leg of PC service. In some ways, I looked forward to the milestone and anticipated boost, but mostly, I felt I was lagging behind. Struggling to find my fit has been a theme during my service. On my third site, living with my third host family, not feeling like I quite fit into my assigned organizations and not feeling at home amongst my peers has been a challenge. What was supposed to be a time to recognize ourselves and our service quickly devolved for reasons other than the diagnosis I didn’t see coming. Maybe one day, post-service, I’ll speak more freely about MST. Fast forward several days when I travel to the hospital for the aforementioned chest X-ray. Upon entering the room, I voice my anxiety and the friendly clinician tells me I have nothing to worry about. As I relay my blood result, she exclaims, “oh!” runs out of the room, rightfully returning in a surgical mask with a bit more hesitancy than before. Luckily, my chest X-ray is clear. Two days later, I’m offered a pamphlet on TB and 2 different treatment options. As I read about the symptoms of active TB, the fatigue and labored breathing I’d been experiencing for the last several months jump off the page. I urge further testing to determine my TB status, which is thankfully granted. The subsequent days are filled with multiple doctor and hospital visits, the low point being a lab tech pounding on my back for what felt like an hour in an effort to force sputum-producing coughs behind closed doors that earned me unabashed stares from the entire waiting room upon my exit (yes, as anxiety-provoking as wading your way through that sentence). Fortunately, my poor lungs are spared further trauma when I’m sent to the physiotherapist who administers proper sputum-production techniques over the next two days. I await results, which come back negative and point to a diagnosis of latent TB. I opt for the 4-month, rather than the 9-month course of treatment. I take half a dose, as instructed, and awaken at 3am with nausea, vomiting, vertigo and a whole host of misery that makes for one of the scariest experiences of my life. A desperate call to my second Mama in the States prompts a even more desperate 4am call to the Peace Corps Medical Officer who at first diagnoses food poisoning, then tells me to refrain from my morning dose of the Rifampin and come to the office in a few short hours. I’m sent for a second opinion where we explore some of the other strange symptoms I’ve experienced over the last several months, including night sweats and joint pain. Additional blood tests and another sputum test is ordered. As I await test results, the days and weeks go by, I am further disconnected from my village, my host family, my current projects and my support systems. My guilt mounts as I can’t effectively communicate my current health status, as I myself don’t have answers. Text, Facebook and WhatsApp messages increase as I press “pause” on my life. I experience some dark days as my fatigue is compounded by a lack of answers. I bounce in and out of each of the stages of grief - denial, anger, bargaining, depression and acceptance, as I clamor to cope. From questioning the validity of medical tests to analyzing interpersonal interactions to feeling as if I’ve made a mistake pursuing the Peace Corps in the first place to finally recognizing the empathy cultivating within me for folks who endure chronic diseases, partner and family notification of medical issues and obstacles of all kinds. I dig deep to remain connected to the light within and around me. I am diagnosed with schistosomiasis, the second most common tropical disease next to malaria, that somehow no one’s ever really heard of. Schisto, as it’s so lovingly referred to among those of us who now know it well, can live in the body for up to 40 years. The parasite can cause some major damage. Amazingly, the treatment is only one day, but as the worms die, the body can react in a variety of ways. I spend the next several days asleep. Doctors tell me it will be months for my body to adjust to life without the schisto present in my body. Unfortunately, I have to start the TB meds before then. It's likely I won't feel like I've got my body back until the TB medication finishes. More days pass. During a follow up appointment at which I’m expecting my new TB treatment, I leave with a prescription for a broad-spectrum antibiotic because something is still out of balance. The doctor determines that I’ll try the 9-month treatment for latent TB once I finish the course of antibiotics. I’m told I can return to site. Panic sets in. Many conversations take place. I decide that starting TB meds back at site, in light of my reaction to the last medication, is a non-negotiable. Living in a rural village several kilometers off a paved road precludes me from accessing proper medical care should another reaction occur. I will start the TB meds in the capital. The antibiotics are uneventful until I get what feels like a cold during the last two days of the therapy. The doctors attribute the symptoms to my body being “drug naïve” and the medication increased my susceptibility to illness. Three days later, symptoms disappear and I start my 9 months of TB medication without incident. I return to my village this week, I speak with my current and former host families to notify them of my diagnosis, the reasons for my absence and my lack of communication. I fear stigmatization and blame and, instead, am greeted with acceptance, understanding and words of affirmation. The dynamics among myself and others in the village shift positively in the direction of curiosity and appreciation. I look forward to the work to be done, the relationships to be forged and health, wellness and balance to be regained. Through these illnesses, I’ve learned to recognize my privilege. Many people don’t get treatment for latent TB. As a Peace Corps Volunteer, I need to take the prescribed medication to prevent my latent TB from progressing to active TB. After taking the regimen, there is a 90-95% chance that I will never get active TB in my lifetime. I’ve taken an active role in educating myself over these last few weeks. Spending countless hours of internet research combined with conversations with friends who have connected me with friends and relatives who have lived with (and survived) TB has been invaluable. I’ve had the luxury of a second opinion, self-advocacy, additional testing and support and urging others to listen to the wisdom of my body. Had I not had such a severe reaction to the first TB medicine, I would not have discovered the schistosomiasis and remedied symptoms that have been plaguing me for months, maybe years. As the last 50+ days have seen me hyper-focused on what’s wrong with me, Angels greet me along the way, stretch my comfort zone and remind me of what’s good. In an epic, yet very non-Peace Corps kind of day, I fill my belly with Mexican food and tapas, then digest before grooving at my first pole dancing class with two new soul sisters and dance the night away on table tops at a local pub. The level of empowerment from this combo is highly recommended. Why don’t we dance on more table tops, people? Days later, I attend a beer festival, odd for someone who doesn’t drink, I know. I go for the music and sunshine and am given the opportunity to dance my way back into my Self. A dear friend comments that she’s not seen me so happy in the last year and a half. I agree. Both days have been among the best I’ve had since arriving in South Africa. I am gleefully reminded of how much music and dancing juice me up and how much my heart yearns for time with soul sisters. I awoke this morning not in the best of moods. The weight of the last several weeks here in Pretoria has been enormous. I’ve been riding a roller coaster of emotions about things that I’m not quite ready to openly write about, but soon will. My morning practices wouldn’t budge the heaviness and a hearty breakfast failed to provide grounding. I took a walk to clear my head. With each step down the tree-lined streets of my guesthouse’s Pretoria neighborhood, I unraveled more and more. My earlier morning rituals of meditation and Morning Pages revealed discomfort in the current limbo state I’m in and the holding pattern in which I find myself. I externalized the feeling and holding pattern, relating it to past situations – home environments that felt toxic, workplaces that failed to contribute to my ability to thrive and relationships that sapped my energy. From my writing, I thought, perhaps, that my current state of exhaustion could be blamed on the last few weeks in which I unexpectedly found myself in Pretoria. The time quickly lapsing, pushing me further and further behind in the programs and projects I tried so diligently to develop in my village. Not being able to communicate openly about what is currently happening in my life combined with physical and emotional fatigue has left me completely depleted. In my Morning Pages, I brainstormed about activities in the States that typically fill me up, such as kirtan and ecstatic dance, and identified friends whose juiciness inspires. I deduced that my current lack of access to these resources had contributed to my current state. As my morning unfolded, I yearned to unthread the story of this troublesome state of being. The brisk fall air here in Pretoria today feels unsettling to my vata. Perhaps my ungroundedness dropped my guard enough to listen closely enough to what was revealed during my walk. I thought about expectations of myself and my Peace Corps service and my current emotional state. I realized that the reasons for my disappointment lie in the fact that I expected these last 16 months to have gone differently. As I walked with that idea, I recognized that the heart of the disappointment is not due to external events, though it felt like many were tragic, but that the true source of my disappointment was that I’d bet on myself to handle things differently. Years ago, I burnt out of the helping profession. I burnt out from life after infidelity broke my engagement and I sought refuge in a yoga ashram in Colorado. In the nine years since, I’ve developed self care tools, studied healing modalities and adopted new ways of living that I expected would buffer myself from trauma, bolster my abilities and lend to my thriving as a successful Peace Corps Volunteer here in South Africa. Instead, I find myself in a familiar state of depletion, exhaustion and burn out with 10 months left of service. As I walked this morning, I dismantled the notion that it is the external holding pattern of Pretoria or Peace Corps or difficult people sapping my energy. The sun peeked through the foliage and warmed my face as the thought burst forth that my former relationships, living environments and workplaces did not construct the complex burnout of my past. I understood that these external forces were not and are not the holding patterns in which I find myself. Rather, I am the one holding the patterns of my current state. I am the one, due to the lay of my neural pathways, previous experiences and history, from my shadow and my trauma, creating the fog in which I currently exist. I could easily wallow in the shame of this revelation. I could blame myself for the current state of things. I could chastise my weak will. I could blame myself for the time wasted and the choices I’ve made. But here, on the fifth anniversary of my mom’s passing, I choose differently. I choose to acknowledge that I’m doing the best I can with what I have. I choose to give myself grace. I choose to voice that it takes courage to reflect and recognize our patterns. I choose to have the patience to sit with the patterns until they themselves dissolve. I choose to accept that I’m the one holding the pattern and that each moment is a choice. There may be some moments that I may not be my best. I may not be the perfect Peace Corps Volunteer or yogini or authentic spiritual being. There may be times when I want to eat a bag of Simba, sleep too much, binge on mindless tv or trashy romance, ignore my mounting WhatsApp messages and to do lists and not leave the comfortable cocoon of my room and that’s okay. The expectations I had of myself to do things differently this time around have been fulfilled. There have been so many times I’ve done things differently. I’ve set difficult boundaries. I’ve had challenging conversations. I’ve advocated. I’ve challenged. I’ve walked away. I’ve fought. I’ve made the tough call. I’ve backed down. Thank you for joining my as I wander and wade my way through Peace Corps service here in South Africa. I vulnerably process my emotional and spiritual learnings in hopes of feeling through, giving back and letting go. I bow in gratitude to you for joining me. I’ve felt the weight of the world on my shoulders for the last year. In my new village, I feel the weight of trying to save a village, which simply isn’t realistic. Though I set out seemingly without expectations, here I listed 85 stream of consciousness expectations in a matter of minutes. How often do we enter endeavors with the weight of the world on our shoulders? How often do we pile on the to-do lists and endless expectations of ourselves until we are burnt up? How can we free ourselves of the weighty, unrealistic demands we place on ourselves ranging from life changes to mundane, everyday tasks? How can we, instead, grant ourselves grace and breathing room and ease and space? I’ve felt the weight of the each of these 85 expectations and likely more I haven’t even listed. I vow to let these go. Right here. Right now. I want to make an inventory of expectations on a regular basis and let those go, too. I don’t have to carry the weight of the world or a village or a person or a task on my shoulders, my mind or my heart. I burn expectations with the intention of grace and breathing room and ease and spaciousness, making room for what is, making space for what will be. I’m actively processing my 27 months of Peace Corps service with a keen eye towards my emotional and spiritual journey. I bow in gratitude to you for joining me. Lately, I’ve felt ungrounded, purposeless, and, at times, angry. I’ve felt beside myself with frustration, questioning my reasons for being here. I’ve spun out so easily. I’ve felt lost. I’ve felt this way for months. Just as I was finally getting used to my former site and community, the wind was knocked out of me and I had to move. Facing a holding period of 5 weeks in South Africa’s capital, Pretoria, felt like a relief in some ways. Feeling the strongest I’d felt since arriving in South Africa 10 months ago due to Pretoria’s hot showers, flushing toilets, the company of fellow Peace Corps Volunteers, smoothies, hot yoga classes and physical therapy offering me daily massages bolstered me physically, emotionally and spiritually. All the grief of leaving the place I embraced as home came rushing over me like a tidal wave. It was compounded by the whirlwind transition to a place so different than my home of the last 6 months. I felt resistance to a new site, a new community, a new family. I felt trepidation about establishing a new home. As timelines entered the picture, I realized the holidays were quickly approaching. Spending my first holiday season alone in a decade furthered the swell. I panicked, yet I had no clue what really lied below the surface. One of the most painful memories of my childhood occurred during the holiday season, or festive season, as its known here in South Africa. As a single parent, my mom deemed my private, Catholic school education to be worthy of great sacrifice. I was on financial assistance and felt the struggle my mom incurred to meet the remainder of my tuition each month. Education in suburban Washington, DC-area private schools means being surrounded by some of the wealthiest kids in the country. One year during my adolescence, my mom faced a particularly dark period of her bipolar disorder. She holed up in her room nearly my entire holiday break. I felt so incredibly alone, so isolated, so incredibly scared. After braving my “vacation,” I endured friends describing the gifts they received and the love from family and friends that they’d spent recent weeks surrounded by. I can’t remember how I responded to their accounts, but this morning, I came face to face with how I felt. For months, fellow Peace Corps Volunteers have been discussing holiday plans detailing upcoming visits from friends and family or planned returns to the US to spend time with loved ones. I named my feelings upon hearing the first itinerary and scrambled to make plans, which have changed and changed and changed again. These last couple weeks, amidst attempts to acclimate to a new site, a new community, a new host family and a new home, which have been fraught with difficulty, I have been trying to formulate holiday plans. I’ve experienced flights selling out as they are in my cart, accommodations booking and other logistics seemingly shifting abruptly. This morning, I felt at my absolute breaking point as my New Years plans dissolved. After a rush of emotions and a friend lovingly holding space for me, the truth was revealed. I have been scrambling to keep loneliness at bay. I have been pushing, pulling and dragging myself (and, unfortunately, others) through this emotional roller coaster of the impending holiday season. I sit with the questions, what does it mean to spend New Years alone? What would it mean if I spent the holidays alone? Tears streaming down my face, I sit with the hurt of that dark season of my youth in which I was so frighteningly alone. I sit with the notion that my family composition has always been different, yet feels so raw right now. I sit with the likely reality that no one will visit me here in South Africa. I sit with the fact that I miss my old host family and my former community. I sit with the truth that my expectations continue to be dismissed, as the reality of this commitment differs so radically from its reality. I sit with the discomfort of loneliness. I sit with grief. I sit with all this and recognize it’s temporary. I sit with all this and recognize it’s all necessary. I sit with the energy and weight of the holiday season because, for many of us, it is intertwined with extremes of grief, joy, obligation, loneliness, overstimulation, contentment, pain, anticipation, gratitude, expectation, disappointment and confusion. I choose to sit with it all, filling myself so full I feel I could burst. In this writing and reflection, my host nieces have knocked on my door twice to relay messages from my host Gogo. Each time, I was drawn back to the present, my Word of the Year for 2017. I’m reminded that there is hope here. There is possibility here. There is a desire for connection here. Now, in this moment, here in the present, I realize that it’s all right. It is all right in this moment. It will be all right in the future. As so much of my life right now is up in the air with the newness of site, community, family, home and to be confirmed holiday and vacation plans, I am reminded of the advice of my teacher in our last session before I came to South Africa. She invited me to refer to my inner map. I realize that since my move, I haven’t been taking good care of myself. The chickens and roosters at my new home wake me throughout the night. My routines of nourishment and exercise are awry. I’m pushing and pulling for integration during a season notorious for inactivity here in South Africa. Our inner maps yield the tools learned through our struggles with light and dark. We hold the wisdom within. It is our choice to speed through the holiday season in overdrive or pause and sink into the present, taking inventory of what is here. There may be residue of the past gripping us tightly. There may be expectations of the future clinging, too. By anchoring in, slowing down, taking breath and taking pause, we may usher in all that is and live awake and aware here and now. I invite you to take that moment of pause right now. Carve out at least two minutes of quiet time. Sit tall and feel the stability of the ground beneath you. Close your eyes, if you are comfortable doing so. What is present, right now, in this moment? What is present for me in this holiday season? What might I need to release from the past, present or future holiday seasons to make room for the fulfillment of my highest purpose? As you are ready, take three cleansing breaths in through the nose and out through the mouth slowly. Open your eyes and reacclimate yourself to this time and space. You may choose to sit further with these questions or journal about them. My deepest gratitude for joining me as I process the emotional and spiritual 27-month journey of Peace Corps Service here in South Africa. I’ve spent so long so angry. So angry, I’ve blocked out love. So angry that it’s clouded the good. So long. I’ve spent so long trying to punish. Trying to harbor resentment. Blocking my own freedom. Aligning with the dark. I’ve forfeited so much time trying to punish. Trying to withhold. Any yet, I’ve been the one who has suffered. I’ve spent so long wishing for a fairytale. Wishing for some magical lever to be pushed to make it all better. To start anew. And yet, here I am, as I take a step back and look at my life, I realize that we were destined to walk in the footsteps of our fathers, our mothers, their fathers, their mothers. Destined to play out the karma. Destined to live out the story of our ancestral pain and trauma. I barely admitted it, but I am. You barely admitted it, but you are. I am the liar. You are the liar. I am in the wrong. You are in the wrong. The marriage was broken. The engagement was broken. The relationship was broken. I was broken. You were broken. The past was broken. How do we move on? How do we let each other go? How have you moved on? How have I moved on? Where do things stand? What do you want? What do I want? Who decides? Who forgives? Who moves on? Why did it happen? Why does it still hurt? What can’t I let go? Why do I cling to the threads of the past that make it so difficult to forgive? What will make it better? What do I have to do to move on? When will I stop hurting? When will I finally be free? Of the Father. Of the Son. Of the Ex. Of my Burden. When will the light shine through to illuminate the shadow? When will absolution and forgiveness, true forgiveness, finally win out? It pains me still to think about the hurt. The denial. My intuition muted. The lies told. At some point, it will dissipate, right? I’ve spent too long holding on. I’ve spent to long clinging to this hope. I’ve spent too much emotional currency to cash it in on anything that matters. At some point, you let go. At some point, you chose her instead of me. At some point, you chose her instead of my mother. At some point, he chose her instead of your mother. At some point, she chose him instead of your father. At some point, we all let go. ♥ Gratitude for joining me as I process the emotional and spiritual 27-month journey of Peace Corps Service in South Africa. My weekends are no longer my own. It took a lot for this American woman to finally relinquish her autonomy. In fact, it took nearly seven months of fighting in country, but today, the light bulb finally illuminated. I set out with the best of intentions each weekend to live similarly as I did in the US. Weekends in America have always been characterized by sleeping in, vegging out, tackling chores, recuperating from the previous week and preparing for the week ahead. Much room is made for “me time”. Not so here in South Africa. Peace Corps Volunteers often explain that the first three months of Peace Corps Life, Pre-Service Training (PST), are intended to make volunteers “Africa tough” and prepare one for their subsequent two years of service. PST resulted in my tangible disdain for the phrase Africa tough. My tipping point occurred on a seven-hour van ride traversing some of this country’s most scenic terrain. The smile on my face spoke of my contentment. A fellow volunteer close to the end of his two years of service, noticed my expression and asked why I was smiling. In explaining the source of my elation, he said, “don’t worry, you’re sure to lose that happiness in the next two years”. Speechless at the time, his words have echoed in my heart and mind many times since he uttered them 5 months ago. I can choose to harden to my life’s experiences, whether here in South Africa or elsewhere. I can choose to meet the jaded and be, likewise jaded, or I can choose differently. Years ago in my former life as a Social Worker, colleagues would often remark on how I responded in crisis. When people react and increasingly gear up emotionally, I tend to gear down. My upbringing, temperament and spirit naturally choose ease. In some instances in my life, that has indeed escalated situations with some people, but I maintain my integrity and my composure. When the out of control are given time and space, they usually calm. Sure, I can choose to become Africa tough. I can choose to be incensed at the pandemics of poverty, HIV, ignorance and trauma. I can allow them to permeate my spirit, settle in, fester and harden me. I can choose to internalize the events taking place in the States both personally and politically. I can react with anger, spite, jealousy and hatred. I can meet that fear right where it exists. I choose. I choose to meet that fear with love - it’s the most revolutionary thing I can do. Today, I choose love. Today, I choose to consciously soften. A dear friend reminded me this week of the importance of softening - the importance of softening to the people in my life who hurt me willingly and those who hurt me unknowingly. It took me a long time to become the vulnerable creature I am today. I’d proudly say she’s anything but Africa tough. I relish the sensitive, vulnerable, empathetic and open woman I’ve worked diligently to become. I sat with all of this this morning and decided that I wish to open and soften to this entire experience of service and the changes taking place, both internally and externally in my life. I finally relinquish control. So, this morning, when I’d planned to spend the day catching up on my to-do list and my Host Mama told me we were going to a traditional ceremony in 45 minutes and to wear a skirt, I obliged by speed-bathing, donning my new Zulu beads and the requested skirt and proudly stepping forth as Africa soft. In what areas of your life are you feeling hardened? How might you be meeting fear with more fear? Anger with more anger? In what areas of your life might you soften? What are the conscious ways you are willing to soften? Who might be willing to support your softening? Might you enlist them in helping you choose to gear down, rather than amp up? What is one way that you’ll choose to consciously soften today? “Megan, you don’t have to be a martyr.” Her words stirred an immediate emotional response at my farewell dinner 3 months ago, yet I shelved them – until now. My dear friend’s advice has been replaying in my mind over the last couple of weeks, particularly loudly as I’ve made the transition to my new home. Perhaps it was the dissonance butting up against my long-held beliefs, shaking me too closely to the core that encouraged me to sidestep the truth in the moment. Whatever the reason, it took this long to awaken to the wisdom of her words. I’ve practiced martyrdom for a lifetime, modeling the example I was shown as a child. I’m good at playing the martyr. Being raised Catholic, life’s inevitable burdens were described as my fated crosses to bear. I learned early on to wear my trauma and hardships as badges of honor to prove my worthiness. As I stepped into the helping profession, this mindset allowed me to align easily with my clients, too often commiserating in our shared brokenness. As nature and nurture forged me to be a giver, I’ve given until I am wholly and completely depleted. I was heartened that this Peace Corps service would be different. I envisioned utilizing the healing modalities and training I’ve acquired in recent years to transform my typical burnout. Coupling healing with service, I thought would encourage me to keep my head above water and prevent any and all sadness, lethargy and disconnection. Honestly, I pictured rainbows and butterflies – all. the. time. Though I’m only three months into this 27-month commitment, I consistently remind myself that this is a marathon, not a sprint. There is still time for the ideal. Until then, however, the panacea may be even more simple. I recognize that being a perpetual giver, and one who happens to often be stubbornly self-reliant, actually blocks the energy of receiving. I don’t allow others to give, preferring to muscle through struggles on my own. Many epiphanies arose the other day as I sat in my hilltop rondaval and realized the beautiful energy of receiving. It is by learning to receive that I open myself up. It is by learning to receive that I allow others to bridge the gap and meet me where I stand or sit or kneel or crawl or cry. It is by learning to receive that I am vulnerable and expose my own limitations. It is by receiving, by allowing others to step up and step in, and extend a helping hand with which to pull me up, a strong shoulder upon which to cry, a listening ear with which I may be heard and an open heart by which I may be loved. This jar, my "Cup of Happiness," contains affirmations, and was generously gifted to me by a fellow Peace Corps Volunteer. The background, deemed my, "Wall of Love," is filled with letters, cards and pictures from my beloveds. It is actually a gift to allow others to give. I’ve fought tooth and nail to live my way, to give so much that I, perhaps, block the flow of receipt. I’ve been experiencing the energy of receiving in the countless acts of kindness I’ve been shown since arriving in South Africa. Fellow Peace Corps Volunteers have graciously leant their ears, hearts, creativity, limited funds, food and friendship in ways that have invited me to receive. Their generosity has lifted me up when I’ve felt so far down. My new host family has offered a home with an absolutely breathtaking view and home cooked meals that have filled more than my belly. New friends and colleagues have gifted me with warm clothes, blankets and companionship. (Yes, it gets surprisingly cold here in South Africa!) Friends have sent love letters and messages from abroad that have bolstered my spirits and encouraged my persistence. I’ve been reluctant to accept offers of care packages mostly out of guilt and not feeling worth the trouble, expense or effort. However, these last few days have changed all that. Something shifted for me this week – emotionally, physically, spiritually. I can’t name it. I can’t pinpoint its exact timing, but I have pivoted to a place where I am more open, more accepting and ready to receive. - How might you be blocking the energy of receiving? - How can you clear your field and open yourself to the energy of receiving? - What might you be open to receive? Nearly shattered my long-held dream. To shatter my long-held dream. Drowns out the preacher’s voice blaring from the radio each Sunday morning. I could barely breathe most days. Today I starve emotionally and spiritually. The eggshells upon which I walk cut through my very soul. The barrage of your attacks is incessant. As an entity meant to keep me safe has fallen short in countless ways. Looking for someone to rescue me to no avail. Countless ways of not being heard, not given voice, being dismissed, belittled. I feel so small, so betrayed, so heartbroken. To the opportunity of what’s to come. I get to walk away from your darkness. I choose to leave your darkness here. I vow not to take it on. I vow not to take it into my body. The darkness goes no further. It compromised my learning, my energy, my mood. Was I my best self most days? For that, I forgive myself. A threshold to step through. I choose to step through. I choose to save myself. May you, too, find your light. With hope for the next chapter, I choose to step through. The “darkness” referred to above speaks to the shadow of Self that exists within us all. Through conscious choice, we may cultivate our inner light. Through conscious action, we may sit with our shadow and understand her better. She handed me the envelope with a card and check enclosed. Though years have clouded my memory of the card's exact wording, her sentiments resonated clearly within me as I choked back tears on yesterday's drive. Every fiber of my being recognized the common thread - the connective element. Many months of reading intended to prepare for my upcoming Peace Corps service, left me, instead, paralyzed by Fear. I sat with this Fear, greeting Her head-on during a recent retreat. As She is not typically my travel companion for ventures abroad, I peeled back Her layers and recognized Her as quite an old friend of mine. I've chosen, since my retreat, to befriend Fear, inviting Her to inspire intentional choices over the last several weeks that have broken cycles and unearthed deep-seated grief, excitement, shame, loneliness, anticipation, regret, despair, much more fear and this memory of my mom from my college graduation. Rather than drown in the wellspring of emotion, I've maneuvered through difficult conversations, purged personal belongings, addressed tasks long-overdue, waded (somewhat gracefully) through these emotions and stepped courageously into self defense training. I'm a yogini. I'm a meditator. I'm a lover of peace. I don't hit. I don't punch. I don't kick. That is, until seven weeks ago. I set aside the misgivings I had about my vulnerability's ability to withstand what I'd long-since thought of as aggression-breeding classes. I decided, instead, to approach self defense training in the same way I approach my meditation cushion, with an empty cup - an open mind - and the highest intention of walking alongside Fear and, perhaps, walking through Her. Early on, my Krav Maga Instructor issued a stern recommendation to tap into our fighting spirit. I left class perplexed, as I'd already worked mightily through my hesitations around hitting, punching and kicking. I latched onto the notion of fighting spirit to mean a physical sense of fight. Aside from faithful class attendance, I wasn't sure sure how else to access this illusive spirit. A discussion with my Instructor at the next class unveiled that this strictly physical understanding of fighting spirit failed to provide the whole picture. I explained that I felt a hint of fighting spirit beyond physicality, but I wasn't sure how to bring that into my training. He told me, "Krav Maga teaches that technique beats strength. It also teaches that fighting spirit beats strength." He went on to encourage me to draw upon my fighting spirit, in all its forms, within my training. This felt like rich territory, ripe for investigation, beyond the confines of my Krav Maga class. 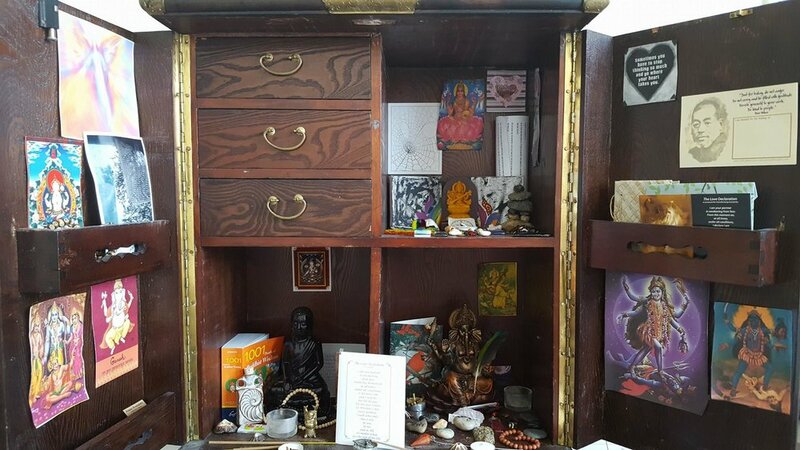 So, I took it to the place I take all my sacred inquiries, to my altar. In my daily meditation and writing practice, I sat with this idea and feeling of fighting spirit. I immediately recognized Fighting Spirit as another old friend. I recognized Fighting Spirit in the peeling back of my own layers. I recognized Fighting Spirit in the untangling of my shadow. I recognized Fighting Spirit in the revelation of my light. I recognized Fighting Spirit in my grief and my forgiveness and my path. I recognized Fighting Spirit in this leap I'm taking to navigate through Fear. I recognized Fighting Spirit in the pursuit of my dreams of serving in the Peace Corps. I recognized Fighting Spirit in my ability to show up to Krav Maga class when, really, I want to quit because of the overwhelming dissociation and surfacing of trauma that likely isn't even mine. In front of my altar and at subsequent Krav Maga classes, I realized that Krav Maga was stretching me through practice and philosophy, furthering my physical endurance and, unexpectedly, leading to spiritual and personal growth. I have explored attributes such as courage, happiness, balance, wellness and wholeness. I noticed that I often regarded them as living outside of myself, mostly ephemeral and attained through fleeting acts and passing achievements. In the last 7 weeks, I have started to believe that courage, happiness, balance, wellness, wholeness and Fighting Spirit actually live inside of me physically, emotionally and spiritually. They may be accessed at any time of my choosing. As I drove this week, from a financial planning meeting, a session of fighting/friending security in the financial form, to my Krav Maga class, a session of fighting/friending security in physical form, I recognized the connective element - feeling enough. The sentiments of my mother on my graduation day echoed a feeling of not being enough. Her card uttered a congratulations and stated that she wished the attached check contained another zero, but that life had dealt her a different hand. She, on that day of my college graduation, expressed regret that her gift was inadequate, that she, herself, was inadequate. At my financial planning meeting, I discovered that my inherited bank account satisfied my student loan debt. In fact, the account equaled, almost exactly, the amount of the check my mom hoped to provide on my graduation day, with that extra zero. Tears sprang forth on the drive from my financial planning meeting to my Krav Maga class unveiling sheer emotion and signifying release. I recognized Fighting Spirit in the form of my mom's resilience, having been a single mom that struggled with the hand that life dealt her, fighting both her own darkness and her own light. Yet, she provided me with a stellar education that served as a springboard for the pursuit of my dreams, the dreams carrying me to South Africa next month. Tears sprang forth as I wished that my mom recognized even a glimpse of her own light. Tears sprang forth as I wished that my mom recognized, just for a moment - that moment - the light that she passed along to me as her daughter. Tears sprang forth at the recognition of her regret on my graduation day. Tears sprang forth at the recognition of fulfillment, 15 years later, of her very wishes. Tears sprang forth with recognition that, at the end of the day, she was enough. Tears in recognition that her dreams were enough. Tears in recognition that her Fighting Spirit was enough. Tears in recognition that my Fighting Spirit is enough. Tears in recognition that my dreams are enough. Tears in recognition that I am enough. I invite you to take a moment, right now, to place your hands on your heart and tell yourself, "I am enough." As you connect with your heart center and the divinity, courage, happiness, balance, wellness and wholeness that lies inherently within you, ask how you might tap into your Fighting Spirit. It is easy to dissociate. It is easy to numb out. It is easy to be disenchanted. It is easy to be angry. It is easy to react. It is easy to fall into habit. It is easy to be apathetic. I am here to do the work. I am here to cultivate my light, my wisdom, my perspective. I am here to illuminate. I am not here to sit quietly, except on my meditation cushion. In a million ways, it seems like yesterday, America's Choosing Day, is a reinforcement of the message, "I am not enough." I invite a different message, a different process, a different perspective. Place one hand on your heart center. Place one hand on your belly. About myself? About "my" community? About "them"? About "their community"? About "other"? About "others' communities"? About my country? About the world I live in? What is it that I believe? If I believe this is a message of hate, it is a message of hate. If I believe this is a cry for help, it is a cry for help. If I believe this is a message and vehicle for change, it is a message and vehicle for change. If I believe this is a call for revolution, it is a call for revolution. If I believe this begs us to love more, this will beg us to love more. If I believe this to be an impetus for change, this will be an impetus for change. I vow not to lose heart. I vow not to stop working for peace. I vow to choose love. I vow to work for peace. I vow to rise up. I vow to stand up. I vow to keep my promises. I vow to recognize that I am the change I wish to see in the world. I vow to recognize the change I wish to be in the world. It starts with a different message, a different process, a different perspective. It starts with a breath. It starts with one hand on my heart center. It starts with one hand on my belly. It starts with deep questioning of what lies in my own heart. It starts with what lies in my own mind. It starts with me - right here, right now. Three years ago today, I received the phone call. Three years ago today, the Officer made small talk. Three years ago today, he said you'd been found dead in my childhood home. Three years ago today, I walked out of my workplace, in shock, without a word to anyone. Three years ago today, I felt more alone in this world than ever before. I'd spent a lifetime fighting the world alongside you. On auto-pilot, I focused on logistics. I waded through the legalities. I ignored the sympathy, in all its forms, even down to the cards. I operated for the next year in shock. Even when being operated on 6 months later, I was still in shock. I thought that I, too, was scheduled to die. It's as if you knew. It's as if you prepared. It's as if I knew. It's as if I prepared. Days before the phone call, I fought hard to get to Wanderlust Chicago. A canceled reservation, fully booked rooms, normally I wouldn't have gone. Something deep inside drew me there. A circle, a cycle, unbeknownst to me. It wasn't until sifting through my childhood home that I discovered my yearning to be in Chicago. I was completing a circle, a cycle unbeknownst to me, yet one that I knew. I'd been conceived in Chicago. You died when I was in Chicago. I lost you long before the phone call three years ago. I lost you to a lifetime of pain that no one might be able to survive. Tumultuous upbringing, walking into your father hanging in your childhood home, lost children, infidelity, narcissism, alcohol, struggling to find the manual to create a loving home, awakening one day to find your own tumultuous home had been created. A circle, a cycle, unbeknownst to you. A circle, a cycle, that I'll never know, but that I know. I lost you in the physical sense, though, long before 3 years ago. I lost you in the emotional sense amidst the trauma of my teen years. I lost you each time you lost your mind. I lost you when you lost your hope. I lost you when you lost your light. You lost me. You lost me beyond the physical and emotional senses. You lost me on a spiritual level. You lost me when I found my hope. You lost me when I found my light. We slipped away from one another when my path diverted. We slipped away from one another when I chose. We slipped away from one another when I started fighting the world on my own. I've learned, since then, to fight through surrender. I've learned, since then, to lean into the light. I've even learned, since then, to peer into the shadow. By peering in that shadow, I have gained. I am sorry for my walls. They were necessary. They protected me. They kept me safe. I have gained a sense of my own light by examining the cracks. These last three years have welcomed experiences that have blown the cracks wide open. In these last three years, I have gained a sense of my own light, healed and whole. Angels I associated with God, which I associated with Catholicism, which I associated with harshness. The last three years have allowed me to soften. The last three years have allowed me to untether. Three years ago, I gained you as my Angel. Since then, you've showed up for me in ways you never could in the physical sense. I acknowledge your signs, your symbols and your presence. Though I miss the gift you had with cooking (it was where you found your light). I miss being able to call you (even if it's just the idea of you). I miss the sheer joy on your face (though seldom seen in your last years on this earth). I have, so very many times over these last three years, felt utterly alone. I've realized in these last three years that you did the best you could with what you had. I now know that your work here in this physically and emotionally-pained body was too much. It was hard for you to find love. It was hard for you to find light. I've spent many moments in the last three years riding. Riding the waves of guilt. Riding the waves of grief. Riding the waves of anger. What I should have done, could have done, didn't do. I've ridden the waves and questions out to seek myself, to find the deep ocean of my heart, to bask in the sunshine of my own light, to chase answers I'll never find. I chose this path in which I've unveiled the greatest gifts you imparted that fuel my very light. You gifted me with an intellectual curiosity in continual pursuit of wisdom. You gifted me with a kind heart compelled to serve others. You gifted me with a strong moral compass which always guides me home. In these last three years, I've found my way to forgiveness. In these last three years, I've unraveled so much mystery. In these last three years, I've found my way to my own healing - a circle, a cycle, one that's now known to me. In these last three years, I've found my way to your light. May all between us become pure light. These last 27 days of the Journey of the Breath have been a wild ride! I started the month of May with the intention to explore the breath and share those learnings with you. I expected simple, straightforward facts, tips and techniques to foster improved lung capacity and deeper breathing. What I've received over the last several weeks has been nothing short of miraculous, expanding my heart and mind by the moment. As I explored the anatomy of the breath, I realized my own patterns. As I expanded my knowledge of the breath, I expanded my awareness of the breath, my body, my emotions, my limitations and, most importantly, my holding patterns. I've noticed, particularly over this past week, the tension that I hold in my body. The Journey of the Breath issued an invitation for me to let go. As I wrote this morning in my Morning Pages, I recognized the process of surrender that I've been undergoing. I've realized that I've struggled so long, that I've fought so long - with myself, the world, situations, entities, my past, the future, my decisions, other people. I finally lay down my arms. As my arms surrender their weapons, I embrace the moment. I pledge to continue to work with my breath to bring me into the present moment. One of the most powerful learnings of the Journey of the Breath has been my recognition of the Gift of the Breath. One of Her greatest gifts is to bring us into the present moment. The Gift of the Breath invites us into the present moment. Over the last 27 days, I experienced many firsts. The breath ushered in awareness and invited me to enjoy these moments. I welcomed my first visitors to my new town. The joy we shared affirmed my decision to move to this beautiful part of the country. I visited Joshua Tree to attend ShaktiFest for breathwork and movement experiences that absolutely rocked my world, which I'm still processing and will likely share more about in the coming weeks. I recognized and released fears around one of the biggest decisions of my life - applying and accepting invitation for the Peace Corps. Last weekend, I worked with the learnings from the Journey of the Breath to release fear and witness the importance of this long-held aspiration that has meant so much to me for so long. I awoke on Monday morning feeling an indescribable peace after dreaming of my grandmother. I then felt called to engage in a 2 hour breathwork, movement, meditation and writing session that illuminated my entire being. I set out to continue with my morning rituals, about to warm up my lemon water, and I thought to first check my email. As I scrolled down my inbox, the "Congratulations!" lept off the screen. Reflexively, I cried, sobbed, bawled, released. I don't remember feeling such strong emotion and excitement and release. With the release of that moment and, I believe the work that I'd done over the last several days, came an invitation to serve as a Community HIV Volunteer with the Peace Corps in South Africa in January 2017. It's hard to put into words the rollercoaster I've experienced this week. I used my breath to process the news, to share and to take a step back. I needed time to sit with my breath. I needed time to process my acceptance of the 27 month commitment and of all the life experiences that have brought me to this point. I am elated. I am honored. I am humbled, not only by the invitation, but by the outpouring of love and support I've felt from my tribe. As we ease into the last 4 days of the Journey of the Breath together, I welcome the continued expansion, awareness and connection I have to each of you. I know, in my heart, that the gifts of the Journey of the Breath will extend far beyond this month. I'm grateful for all of you who have ventured with me on the Journey of the Breath! Please share your experiences, questions and revelations below or on Connective Elements' Facebook Page. If you've missed the Journey of the Breath, it's not too late! You've got 4 days of new Facebook posts and I encourage you to explore the Facebook Page to discover a bevy of insights on the breath. I am incredibly grateful for your love, support and understanding as I transition from my reflections into action, not only today as I answer the neglected texts, calls and messages from this past week, but as I prepare to serve in South Africa. I'm not sure how long it's been happening. My guess is that it's been years, perhaps even decades, of breath-holding. As I rolled out my far-too-neglected yoga mat and centered myself earlier today, the personal asana practice I attempted to rekindle quickly took a back seat. As I stilled myself, this breath-holding pattern immediately unveiled itself within my being. The pattern then commanded my attention for the next two hours. I sat with my breath, worked with my breath, moved with my breath, gave space for my breath. I became absolutely illuminated - physically, emotionally and spiritually. Questions and deep knowings emerged about the connection between breath and life. Yoga teaches us that breath is life. Breath is the foundation of yoga, meditation, exercise, health, wellbeing and balance. Breath connects us to our life force, our energy, our vitality. I yearn to voyage more deeply into this transformative connection between breath and life. I am inspired to embark upon a Journey of the Breath during the month of May and I welcome you to join me! Throughout May, we'll place intentional focus on the breath. Daily, I'll share research, tidbits, knowings, questions and tips about the breath (and breath-holding) on Connective Elements' Facebook Page to support your practice. I'm not sure where we'll end up, but I look forward to connecting with the beauty of the breath. I look forward to the inhale. I look forward to the exhale. As my 9 month trip through Southeast Asia wound down earlier this month, I honored my burning desire to visit the Saraswati Temple in Ubud, Bali one last time. Within moments of taking a seat outside the grand temple gates, it instantly became crystal clear what beckoned me there - a call for seva. As I gazed upon the Temple's beautiful lotus pond, the goddess wisdom residing at the Temple quickly imparted the message that I should offer a month of free healing sessions. That month is almost here! February 2016 will be honored as a month of Love from Mother Bali! I'm elated to offer a month of seva - loving, selfless service without expectation. Service is one of the most integral threads of my core being. I'm pleased to gift 36 intuitive healing sessions throughout the month of February. I am offering 1 hour individual sessions throughout the month of February 2016. Read on for details or jump in by signing up for your individual session here! Just jot me a note that you are interested in a "Love from Mother Bali" session. There is no expectation of action on your part, aside from signing up. All that is asked is a simple willingness to receive healing from Mother Bali, as transmitted through my meditation and hour long session. I'm going into these sessions without expectation. I'm answering the strong pull to provide these sessions. The format of these sessions is new to me. I have no idea if I'll be called to simply sit in meditation or if I'll engage in healing modalities such as reiki, chakra work, sound healing or yoga during the hour-long focus on you. I'm incredibly honored to be the vessel through which to transmit Love from Mother Bali. As folks sign up, I will notify you of the day and time of your session via Facebook message. You need not be available during that time for a call or regular appointment with me. Though, if you are feeling called to sit in synchronous meditation during your scheduled session, I encourage you to honor that. Should there be any messages that emerge for you during your scheduled session, I'll absolutely relay them after the session. Cambodia has helped me feel again. It's broken me wide open. Perhaps it's from the collective trauma here or from the light reflected in the beautiful childrens' smiles, I don't know what it is I've connected with, but it's broken straight through. I am so very grateful to once again feel the flow of tears. I am so very grateful to again feel the burn of desire. I'm so very grateful to FEEL. I haven't felt in so long. I can't explain it. I can't put it into words, but this place is magic. Cambodia has worked its magic on me in ways I may not even recognize. I am so incredibly grateful from the tips of my toes to the top of my head to the entirety of my heart. I ♥ Cambodia is part of a collection of writings that chronicles my current inner journey through Southeast Asia. I've spent my entire adulthood in partnership to make up for a childhood of uncertainty. Never having to stand on my own two feet, I'm ready for independence. I'm ready to step forward into my authentic, courageous self. I'm curious about the choices I'll make. I'm curious about how I will survive. I'm curious about how I'll thrive. It is only when I set forth on a journey halfway around the world that I realized my deep need for independence in this way. It is only when I set forth on a journey halfway around the world that I recognized my need for a high degree of enmeshment. I am ready to let go. I am ready to breathe. I am ready to venture forth on my own. I'm scared. I'm excited. I'm proud of myself. As I glanced at my feet on my yoga mat this morning, I wondered how they will hold up. I breathed into the connection, grounding and stability inherent in my own two feet. I felt the strength and stability in my feet and breathed in groundedness and connection. I breathed in capability and confidence and breathed out fear. I breathed in courage. I released fear. This opportunity to recreate my life is exciting. It's scary, no doubt, but it's fresh, it's new. I want to live my way to the answers. I want to live the questions. My soul yearns for this choice. My heart trusts that my path serves my highest good. I recognize that it may not be easy. I also recognize I've laid the groundwork for a path filled with ease. As I near my fullest purpose, placing one foot in front of the other, I'm confident that I'm walking the path I was meant to walk, one step at a time. Invite yourself to try this meditation, linking breath with intention. Find a stable, quiet place in which to stand. Breathe into the connection, grounding and stability inherent in your own two feet. Feel the strength and stability in your feet. Breathe in groundedness and connection. Feel the groundedness and connection coming up from the earth, seeping into your feet, your legs and spreading up your body all the way to the top of your head. Breathe in capability and confidence and breathe out fear. Allow capability and confidence to likewise arise up from the earth, into your feet and then up your body. Finally, breathe in courage. Allow it to seep up from the earth through your feet. Allow courage to fill your entire body. Exhale and release any and all fear. Finally, one last time, breathe in courage and exhale fully. My Own Two Feet is part of a collection of writings that chronicles my inner journey through Southeast Asia.